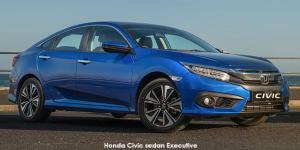 The quiet hum and athletic form of the Honda Civic is turning heads at Mekor Honda Umhlanga. This is thanks to its low stance, clean lines and advanced aerodynamics. Comfort is optimised for all passengers with ergonomically shaped front seats and generous leg room in the back ensuring premium ride quality. The Honda Civic is designed to keep you safer on the roads. The technology features include a touch screen display enabling calling, messaging, navigation and audio control standard across all variants. The standard safety features include front 3-point seat belts with an automatic tensioning system, multi-angle rear-view camera and brake assist. Cruise control, collision warnings and lane-keeping assist are additional features. To experience driving pleasure with the Honda Civic’s eco-friendly Earth Dreams Technology and 27kW VTEC turbo engine, visit Mekor Honda at Mekor Honda Umhlanga for Durban North and KZN.